It is the fag end of monsoons. Clouds do linger in the sky most of the time but it seldom rains and an occasional drizzle suffuses the air with the earthy scent but makes it hot and humid. It is a hot afternoon and the Sun is quite strong in spite of the scattered clouds that cover it every now and then. 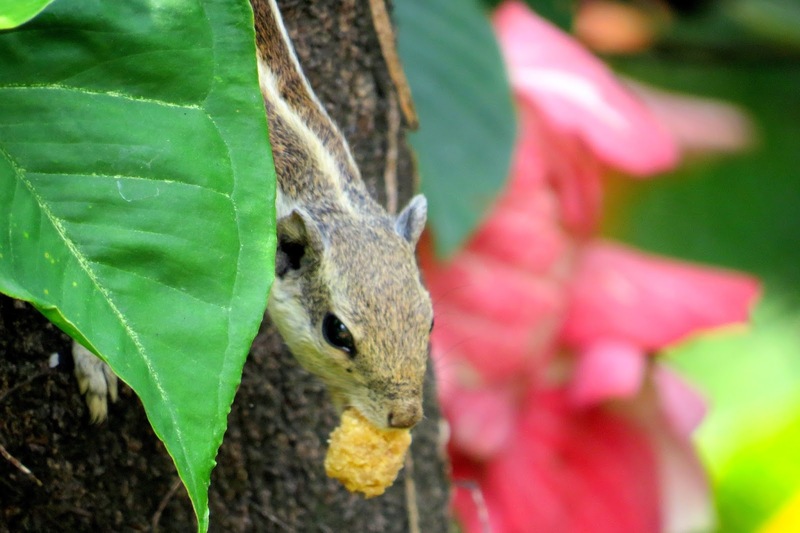 We noticed two juvenile squirrels playing in the trunk of a fish tail palm. They chased each other, going around the moss laden trunk in circles and reached the grassy ground below. One of them found something that we assumed to be a piece of bread and rushed up to one side of the trunk munching it. Soon, the other squirrel reached there and the first one handed over her morsel to her. We marveled at their camaraderie ship and selflessness. It was a beautiful sight. 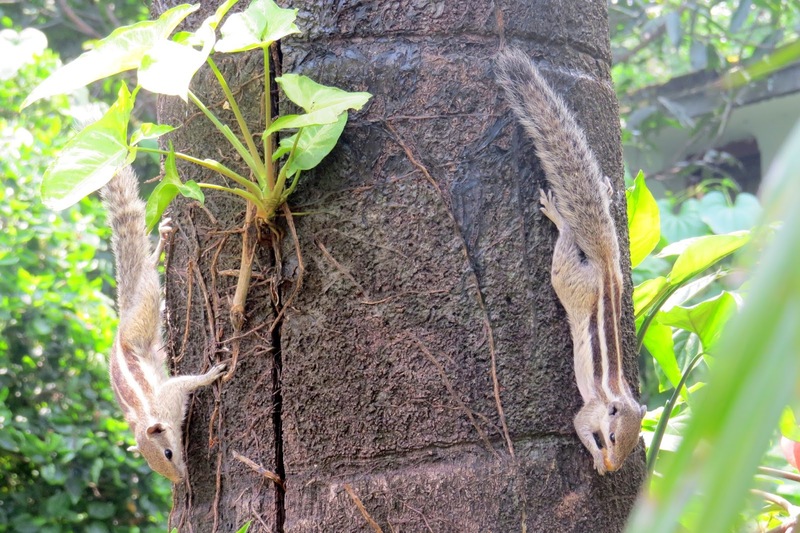 Soon they lunged at the low branches of Mussaenda and then leaped on to the higher branches of Neem tree, and chasing each other, they were out of sight. There is so much to learn from nature. 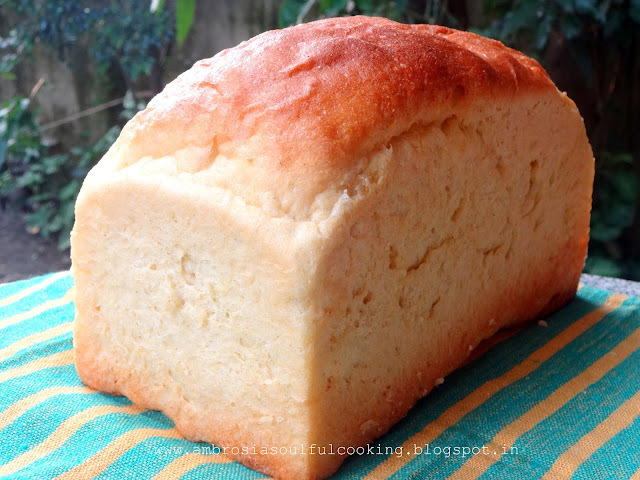 Hot and humid weather is excellent for baking breads. A cornmeal bread is being baked. Yeasty aroma spreads all around indicating that the bread is done. 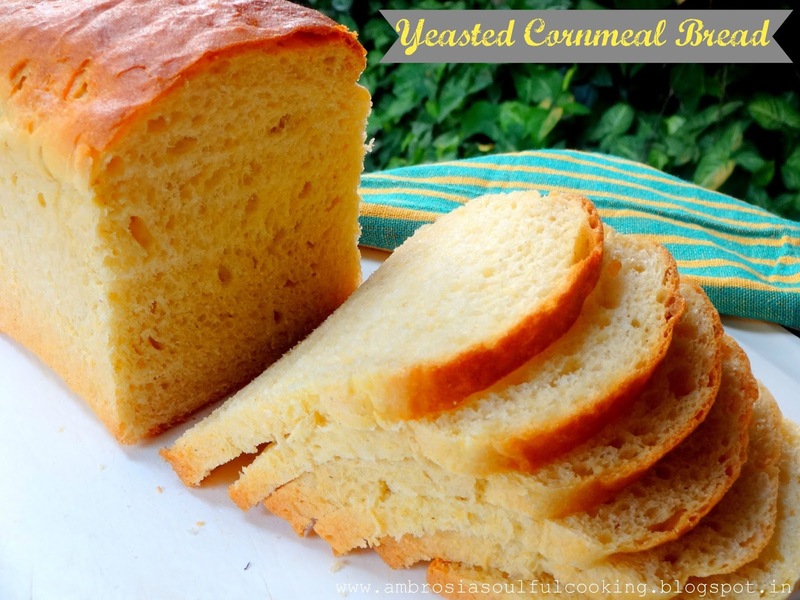 Cornmeal lends a yellowish tinge to the bread and makes it airy and light. The crust is soft and the crumb is fluffy. 2 ¼ teaspoon instant yeast. Whisk together flours and salt. Add olive oil and mix well. Mix together water and yeast. Add honey. Start kneading by adding a little water at a time. Keep kneading till you use up almost all water and a slightly sticky dough is obtained. Transfer dough to an oiled bowl and turn around so that it is coated with oil on all sides. Cover and leave in a warm dry place to rise for 1 hour or till double. Punch dough and transfer to the counter sprinkled with some all-purpose flour. Shape it into a log by rolling out into a rectangle (about 8 inches wide) and then rolling towards you tightly. Pinch seams to seal and tuck in the sides. 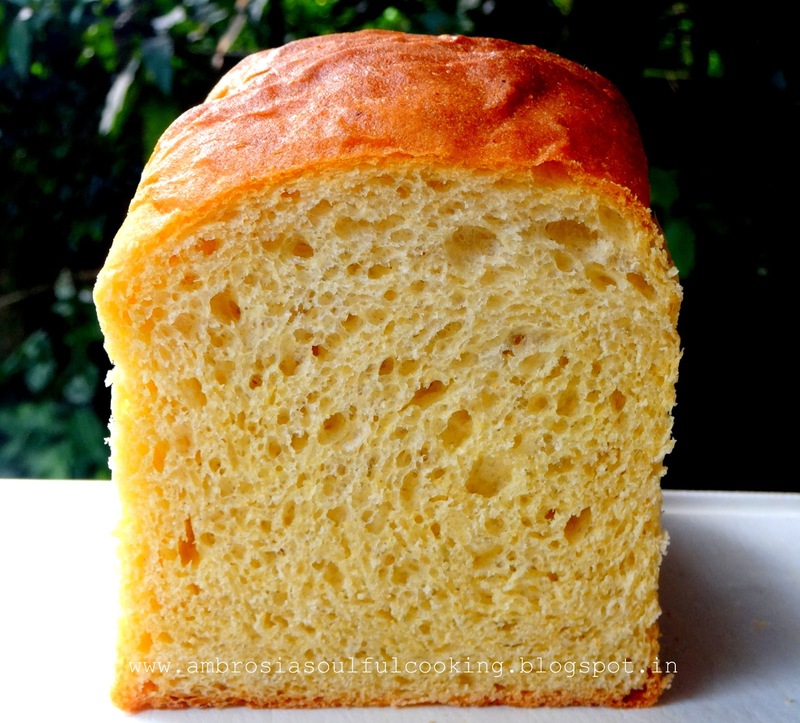 Place it in an oiled loaf pan (8x4 inches) with seam side down and leave to rise for one hour or till double. Bake in a preheated oven at 190 degrees C for 25 to 30 minutes. The top should brown evenly and the bottom should sound hollow when tapped. Remove from loaf pan after 10 minutes. Cool in the rack, slice next day. Hi, can you give ingredients in grams? Beautiful....both your sweet images of the little squirrels and the bread. 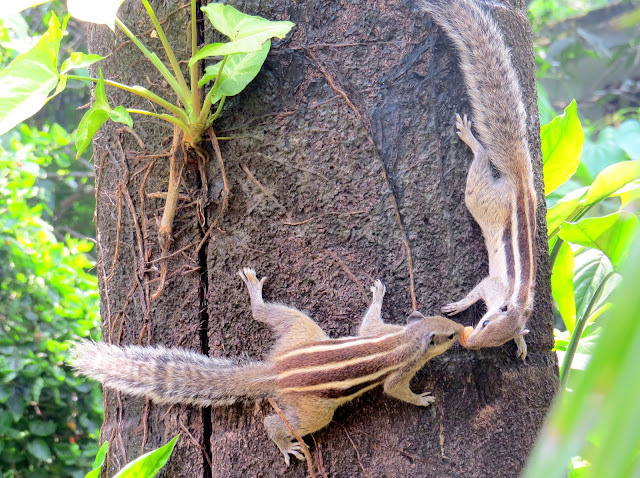 We had the great privilege of visiting India this past July and August and these little creatures reminded us of chipmunks in the States. Blessings to you! Hello, A big thank you for your visiting my space and the lovely words. Next time when you come to India, do let me know. We share a comon love for mountains. I live in the Himalayan foothills. I would love to meet you and bake a bread for you. I have decided to stop buying bread and make all of our own bread so this post was incredibly well timed. I have also decided to start blogging regularly again to share what we are doing and how we are doing it on Serendipity Farm. Thank you for this excellent blog post Namita. I love how you share your beautiful garden with us all and your photography is excellent. LOVE those squirrels :). Hi,lovely bread and all those pictures..........wonderful.Feeling like I myself been there right now.I have a doubt - I don't have instant yeast.Instead i have active dry yeast.How much should I use and what adjustment should I make? Hello, Thank you for visiting my space :) . If you have active dry yeast, use same quantity as mentioned in the recipe. Active dry yeast is a dormant form of yeast and needs to be rehydrated or proofed prior to using it in a recipe. This means that the yeast needs to be dissolved in warm water (a bit of sugar helps the yeast to activate more quickly since sugar acts as a food for the yeast) and left for a few minutes to activate before using in the recipe. You may disslove a teaspoon of sugar in warm water, add yeast and cover for 15 minutes. The yeast will foam. Follow the recipe.